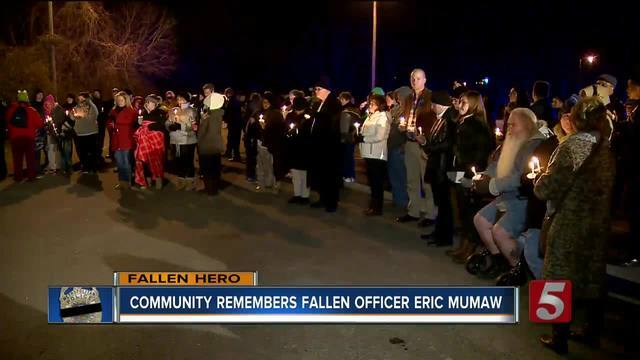 Nearly 150 people attended a candlelight vigil Friday night for fallen Metro Police Officer Eric Mumaw. Many braved the cold to honor the officer who they say dedicated his life to the Nashville community for 18 years. "One thing I can say about Eric is he always had a smile on his face," said friend Hannah Penn. Penn recalled Mumaw would visit her and her colleagues during the third shift at Steak and Shake in Madison. She said he would always tell jokes and share advice with them. "Eric gave his life for a complete stranger, a complete stranger, and I'll guarantee he would do everything the exact same way," she said. Several members of the Metro Nashville Police Department attended the vigil held at Peeler Park. "What happened a couple of days ago is probably the worst thing that could happen in our line of work, When I was a rookie, whenever my training off officer was off I would ride with Eric, and I could tell you he was the nicest, honest, patient people you would ever meet," said Madison Precinct Commander Sebastian Gourdin. Mumaw died while attempting to save a woman from drowning at Peeler Park. Friends said the man with the smile dedicated 18 years to the Metro community, always putting others before himself. "Eric dedicated his life to the Madison community. He worked almost all of his career here in Madison, he loved Madison and Madison loved him," said Chief Steve Anderson. On Monday, February 6, Mumaw's body will be escorted by officers from Spring Hill Funeral Home to Cornerstone Church at 7 a.m.
A visitation will be held at the church from 9 a.m. to noon, followed by a memorial service.